Dudes. Dudettes. I love this time of year. The cherry blossoms are in bloom, Creme Eggs are in abundance...and in Seattle, Trophy Cupcakes' most anticipated cupcake of the year is returning Easter weekend: The Marshmallow Hi-Hat! 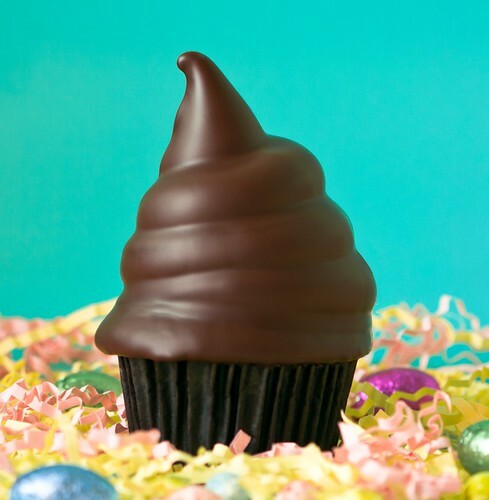 Appearing just two days per year, the Hi-Hat Cupcake is made by "topping Trophy’s decadent Valrhona chocolate cupcake with a sky-high swirl of pastel-tinted marshmallow frosting, and then they are hand-dipped in semi-sweet Callebaut chocolate! Pretty pastel marshmallow, rich Belgian chocolate, and moist Valrhona cake all rolled into one amazing confection." This epic sweet will be available at all Trophy locations on Saturday, April 7, and at the University Village and Pacific Place locations on Sunday, April 8! The treats can be ordered in advance. For those interested in a Saturday, April 7 delivery, orders must be confirmed by Friday, April 6. Check us out on Facebook at facebook.com/trophy.cupcakes and Twitter at @trophycupcakes for delivery specials!